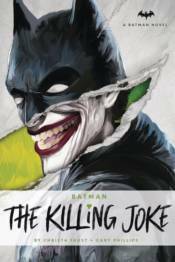 A criminal is immersed in chemicals that disfigure him, driving him mad and giving birth to the Joker. As Joker sets out to break Commissioner Gordon, shooting and crippling Gordon's daughter, Batman races to rescue him. This edgy adaptation by Hard Case Crime novelist Christa Faust expands adds intricate layers to the cast and events of the graphic novel, further examining the nature of morality.